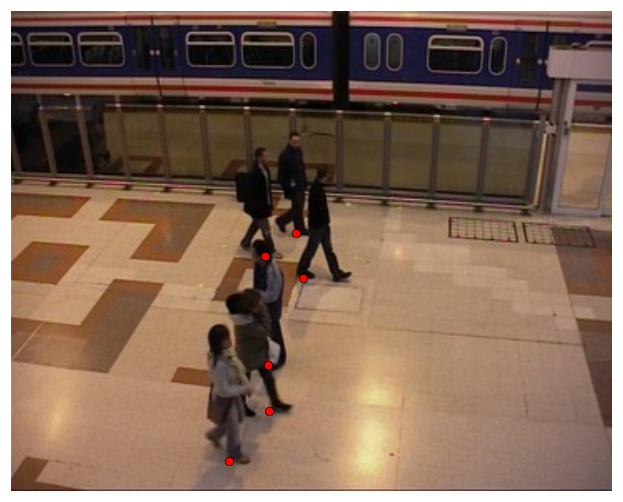 This paper proposes a method to locate and track people by combining evidence from multiple cameras using the homography constraint. The proposed method use foreground pixels from simple background subtraction to compute evidence of the location of people on a reference ground plane. The algorithm computes the amount of support that basically corresponds to the “foreground mass” above each pixel. Therefore, pixels that correspond to ground points have more support. The support is normalized to compensate for perspective effects and accumulated on the reference plane for all camera views. The detection of people on the reference plane becomes a search for regions of local maxima in the accumulator. Many false positives are filtered by checking the visibility consistency of the detected candidates against all camera views. The remaining candidates are tracked using Kalman filters and appearance models. Experimental results using challenging data from PETS’06 show good performance of the method in the presence of severe occlusion. Ground truth data also confirms the robustness of the method.